With the growing popularity of contemporary rugs for sale, there has never been a more exciting array of cutting edge designs to choose from. New collections are developed every season to fit with the latest interior trends, but the lifespan of a good quality modern rug will far surpass a fleeting fashion. It’s important to understand the impact a rug will have on a room and how it will interact with existing furnishings. However, above all, buy what you love. The sheer quantity of options can be quite overwhelming, especially with many retailers including Bazaar Velvet also offering bespoke services. However, browsing existing designs either from images or actual stock pieces is usually the best place to start. If visiting a rug showroom, it is advantageous to bring fabric samples from the room in question, as placing these next to the rugs can be a really helpful way to determine if colours and patterns work well together. Furthermore, at Bazaar Velvet, we offer a free home trial service to local clients, bringing a selection of stock rugs to be viewed in situ. Please contact us with your address and an outline of your requirements to find out more. Take a step back and consider the general overview of the room. 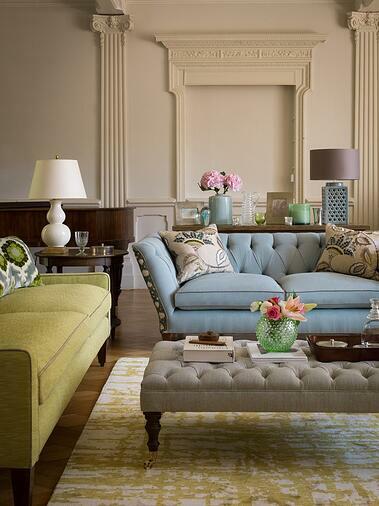 If it already includes a wide array of colours, don't overwhelm it by adding yet another hue. Instead draw on existing accent tones, such as those found in cushions or artwork. This will help create a sense of synergy. However, don’t feel they have to be exact matches- often a slightly lighter or darker shade will work just as well. 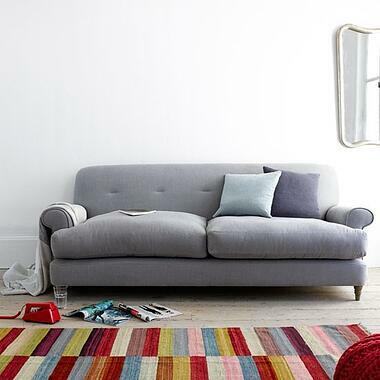 If you have a boldly coloured sofa or walls, a primarily neutral rug can help break up the large areas of colour. This will create a more restful space. 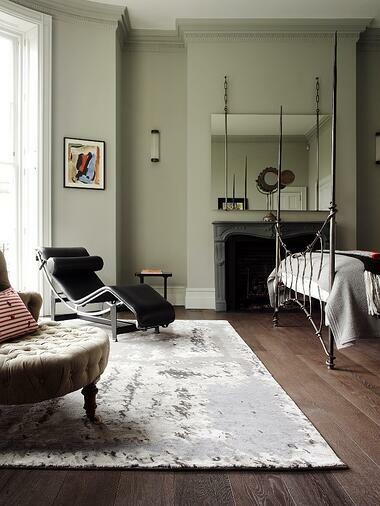 For a more neutral room, a contemporary rug can be the perfect way to inject colour. If you’re not very confident in choosing from scratch, be inspired by magazine photographs or choose colours from a favourite painting or fabric print. Alternatively, you can try layering different shades of neutrals. However, ensure you choose a rug that provides a significant contrast with the sofa fabric, and ideally also the floor and walls, or the room will lack depth. For a room that is a little on the dark side, introducing a pale coloured rug can have transformative effect, drawing in light and enhancing the space to make it appear larger. However in the correct setting, dark rugs also have their advantages. They can work splendidly in rooms with a lot of natural sunlight, giving a more dramatic effect than a paler rug. When choosing a rug to complement a floor, there are differences in opinion on whether to camouflage or contrast. In our view, it is the undertones of the wood colour that matter the most. Woods that have cool or yellowy undertones such as grey oaks and walnuts work well with grey and blue rugs, whereas those with warmer, more reddish undertones combine well with other warm colours. 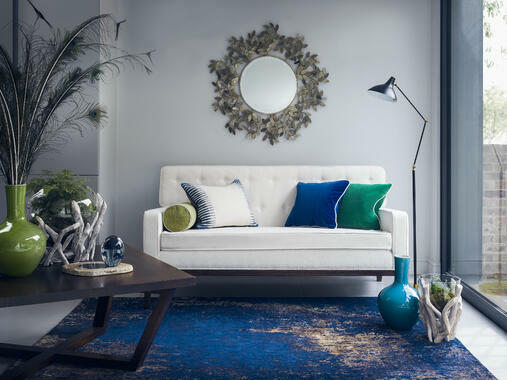 Julia Green from Greenhouse Interiors says; ‘remember, rugs can either quieten the volume of a room, or turn it up!’ Ask yourself the mood you want to create in the room and if you want the rug to make a statement or be absorbed into the background. A dark richly coloured rug can make a room more cosy and intimate, whereas a bright or light colour can be more energizing. Pale neutral or pastel colours are calming so are the ideal choice for a bedroom for example. Practicality should also be considered, so avoid black or white in high traffic areas; a medium tone neutral or grey rug will be the most forgiving to everyday use. Many designers, such as Staffan Tollgard, create their interior schemes from the floor up. ‘We choose one or two patterned fabrics or look to a contemporary rug or piece of art and then draw out a colour link from that.’ This can be a really easy way to create a colour scheme for a room. There are other advantages too. It’s great to have the opportunity to buy a rug you really love, rather than just one that fits with items you already have. It's much easier to find fabrics to complement the colour of your rug, rather than the other way around. Remember a good quality hand knotted rug can last a lifetime. 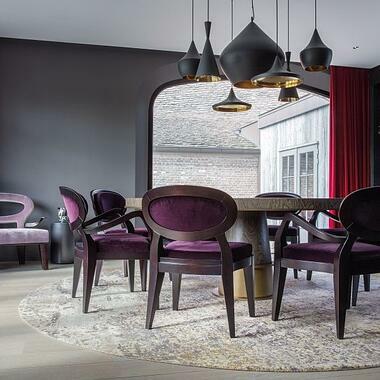 Any Core Collection or archive design by Bazaar Velvet can be created in any colour at no additional cost. We can help you explore the options by creating realistic computer visuals. View our Core Collection now or contact us for archive designs. 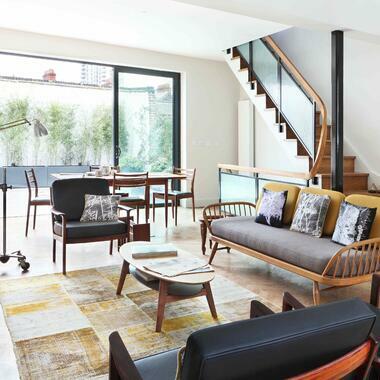 Interior designer Peter Mikic believes in the benefits of an interesting rug; ‘Add pattern to the floor with a soft, vibrant rug – it creates cosiness without overstuffing the room.’ However, many consumers still shy away from bold patterns as they fear they will clash with their existing furnishings. However, a patterned rug can add depth, interest and personality to a room, and there are many combinations which work together. If you have a design idea, take advantage of the bespoke rug design service at Bazaar Velvet. Our expert team can create any design from scratch and provide you with realistic computer visuals and colour samples. Read our bespoke rug guide to find out more. The golden rule of mixing patterns is to never combine two of the same scale. This is because your eye struggles to decide which design to focus on, resulting in an unrestful interior. The majority of designs found in sofa or cushion fabrics for example, tend to be small scale, so these can easily be offset with an oversized rug pattern. Although there is no rule against repeating certain design types throughout a room, it’s best to contrast contemporary rugs with the patterns that are in the closest proximity. This is because the outlines of different objects can otherwise become confused. For example, a decorative foot-stall with a busy motif would be best paired with a calmer cleaner rug design. Although an interior may be eclectic, a rug should still keep a common thread with other furnishings. A designer rug is an important factor in determining the overall tone of a room. Do you want it to be playful, modern or sophisticated? Casual or formal? Take inspiration from the existing design elements. Your approach to finding the right rug design should be influenced by the type of room in which it is to be placed. For example interior designer Frank de Biasi suggests keeping a bedroom rug minimal whereas "In the living room, you can do anything… It is really where you can have a bold pattern." Living rooms and Hallways are ideal areas for statement rugs as they can add vibrancy and personality. Also, patterns are far more forgiving than plain rugs making them more suitable for high traffic areas. Choosing modern rugs can be approached in a similar way to choosing a piece of artwork. If a design grabs your attention for the right reasons, don’t shy away from it. A statement rug can provide a focal point for a room, with other items chosen to compliment it. A design that fills you with joy can always be accommodated. Start your rug search now with a browse of the collections at Bazaar Velvet. Use our drop down menu to explore collections individually, or view all and use our helpful filters to help you find your desired colours and styles. At Bazaar Velvet, we are passionate about beautiful rugs. If you have any questions, we'd be delighted to help.